FANBOY PLANET.com . : cf-garygygax :. He's someone who I always wanted to meet and thank for creating the one thing that had more influence on me than most of my school teachers and the Bible combined, and that was "Dungeons and Dragons." I went to a Catholic grade school and it was there I got hooked during recess. Wizards, Clerics and Thieves -- oh my god, how cool was that when you're eight and it's before video games took over the youth and even before VHS even! The creativity and joy this brought to me as a kid and as a young adult, man, I found myself wanting to write stories after creating dungeons for the game. Seriously, we grew up in El Monte, CA and we had no money, so this was "the entertainment" we had and it was all we needed. And we dreamed of going to Lake Geneva and playing D&D with Gary Gygax; hell, he was the "Man" and his dungeons were awesome! From the age of eight to the age of thirty, "Dungeons and Dragons" was a huge part of my life and when it was time to make my first movie, I wrote about what I knew. That's my life story up there in Gamers. I'm not "...a f***ing jock with a trust fund" making fun of gamers; that's pretty much a huge part of my life from my childhood. Each of those characters I can relate to, too, very well in fact! A scene in which the character Reese scene calls about his character dying, that's not writing folks, that's living what you write! When we went ahead and started the ball on making Gamers, we contacted Wizards of the Coast and I swear to god they were no help; at one point the main guy even said "You know there's already a movie being made just like this?" I told him "Bull***t. If there is, then we will go to court, because this is based on my life story." We then contacted Gary's guys and we were so close to getting his approval; however, Gary's guys were concern the movie made fun of "Gamers" and that the script had a lot of scenes which didn't put them in a positive light. His guys were cool, and it just didn't work out. We didn't want to take anything out of the movie, even if it meant we couldn't get Gary's blessing. In the end we had to do what we felt right and Gary had a reputation and an amazing body of work he needed to protect. And who can blame him? We were just a bunch of idiots with a bank loan, credit cards and a dream. But look at Gary's influence on video games. RPG games owe a lot to the man. And I will always be thankful for his amazing creation. Without it, I would have had a much different life and I was such a bad speller and people gave me s*** for it, that I don't think I would have done creative writing if it wasn't for D&D. Because nobody gave a s*** if the DM could spell. It was all about the dungeon and creating hours of non-stop fun and action. Other than Springsteen, I can't think of another person who influenced me as much that wasn't related or a friend. 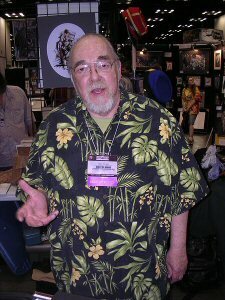 Gary Gygax, I thank you from the bottom of my heart for your imagination. Without it there would be no Gamers and I can't even imagine my life without "Dungeons and Dragons." It was so influential and so worth every hour dreaming up stories. So Viva La Gary Gygax! We will find a way to properly honor him. Chris Folino is a writer/director living in greater Los Angeles. His first film, Gamers, will be released on home video through Monterey Media on May 6, 2008. He is also the writer on the upcoming Catastrophic Comics' titles Sparks and Mythology Wars. This article appeared in a slightly different form on his MySpace blog.